Applications Available for Officer Memorial Scholarships :: RickeyStokesNews.com! HOLMES COUNTY – Applications for the 2019 Officer Memorial Scholarships are now available. 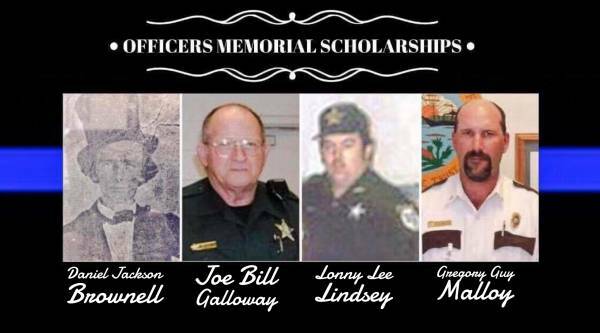 These onetime $1,000 scholarships are awarded in memory of Sheriff Daniel Brownell, Reserve Deputy Joe Bill Galloway, Deputy Lonny Lee Lindsey, and Holmes Correctional Institution Colonel Gregory Malloy, all Holmes County law enforcement officers killed in the line of duty. “We are proud to offer these scholarships in memory of these four fallen law enforcement officers,” said Holmes County Sheriff John Tate. “Not only is this a small way to honor their service and remember their sacrifice, it is a way to help support the future of public safety.” Scholarships are funded through events such as concealed carry classes and other fundraising efforts by the Holmes County Sheriff’s Office. To apply for one of these scholarships, students may see their school counselor or pick up an application at the Sheriff’s Office, located at 211 Oklahoma Street in Bonifay.